Manufacturer & Supplier of PLC Panel. Our product range also comprises of Control Panels, Electrical Control Panels and VFD Control Panel. To meet the diversified requirements of our prestigious clients, we are engaged in offering a qualitative range of PLC Panel. The offered PLC panels are installed with SCADA to control sense and monitor different industrial signals. 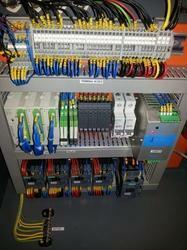 Offered PLC panels are fabricated for dedicated controller projects or simply as a part of the larger networked system. Customers can purchase these PLC panels from us in quality packing at industry leading rates within a promised time frame.